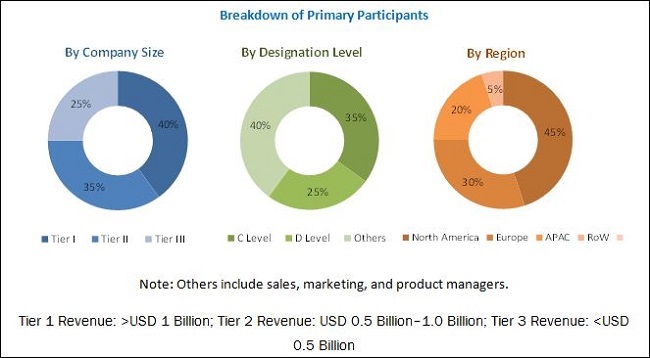 [143 Pages Report] The underfloor heating system market was valued at USD 2.53 Billion in 2016 and is expected to reach USD 4.23 Billion by 2023, at a CAGR of 7.5% during the forecast period. To analyze competitive developments such as joint ventures, mergers and acquisitions, product launches and developments, business expansions, and research and development (R&D) activities in the market. This research involves an extensive use of secondary sources, directories, and databases (such as Hoovers, Bloomberg BusinessWeek, Factiva, and OneSource) to identify and collect information useful for this technical, market-oriented, and commercial study of the grow light market. To find the overall market size, top-down and bottom-up approaches have been used to estimate the sizes of other individual markets by using percentage splits from secondary sources such as Hoovers, Bloomberg BusinessWeek, Factiva, and OneSource as well as with the help of primary research. The entire procedure includes the study of the annual and financial reports of the top market players and extensive interviews of industry leaders such as CEOs, VPs, directors, and marketing executives for key insights (both qualitative and quantitative) pertaining to the market. The underfloor heating systems market comprises key manufacturers such as Danfoss A/S (Denmark), Uponor Corporation (Finland), Emersion Electric Co. (US), Honeywell International (US), and Robert Bosch (Germany). Pentair PLC (US), Mitsubishi Electric Corporation (Ja pan), Schneider Electric SE (France), Siemens AG (Germany), and Nexans S.A. (France). In this report, the overall underfloor heating system market has been segmented on the basis of component, type, installation, application, and geography. The underfloor heating system market is expected to reach USD 4.23 Billion by 2023, at a CAGR of 7.5% between 2017 and 2023. 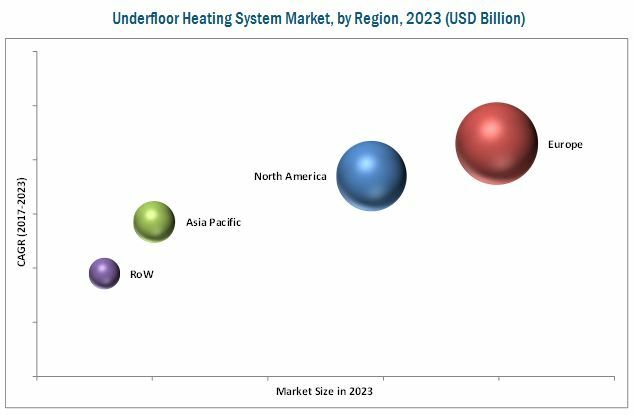 The progress in research and development (R&D) facilities, increasing demand for renewable energy products, and encouragement of energy efficient products are the key drivers for the underfloor heating system market. This market is segmented on the basis of component, installation, type, application, and geography. Among all applications, the residential application is expected to grow at the highest CAGR during the forecast period. The development of real estate and because of considering it as a key feature for residential application is expected to show high growth in the coming years. On the basis of type, the underfloor heating system market has been segmented into electrical systems and hydronic systems. The low operational cost, longevity, and the requirement of minimal energy, once the room is heated, are some of the key drivers for the hydronic underfloor heating system market. The underfloor heating system on the basis of installation has been segmented into new installation and retrofitting. The new installation is expected to grow at the highest CAGR between 2017 and 2023. The market for n ew housing offers underfloor heating a significant opportunity, as more rigorous energy-efficiency legislation is being introduced in developed nations with changes to building regulations supporting sustainable homes. For example, in the UK, the code for sustainable homes was introduced by the government in 2007 to improve the environmental specification of new homes. The code measures the sustainability of a new home against 9 categories of sustainable design. The specification ranges from levels 0 to 6 (zero carbon). The code sets minimum standards for energy use at each level, in addition to some mandatory elements that should be met. Owing to all these new standards and mandates, this market is expected to grow rapidly during the forecast period. Europe was the leading market for underfloor heating systems in 2016. Higher levels of insulation driven by regulatory requirements and initiatives are contributing to a reduction in the overall heating load, making underfloor heating a more practical and efficient heating solution for Europe. Moreover, Scandinavia is the coldest place in Europe. People in Scandinavian countries require heating sources throughout the year. Moreover, in particular, growing environmental and energy-efficiency concerns are seeing a greater influence in the specification of underfloor heating products as European countries move toward a low-carbon economy. Furthermore, underfloor heating designs are predominantly concerned with delivering increased energy efficiencies. For example, the development of “intelligent” underfloor heating controls that can closely monitor system energy consumption to reduce waste and running costs. These benefits are driving this market in Europe. Tiles or stones can be very cold, especially in winter season. The only solution to this problem is to heat your home with radiant heating, i.e., underfloor heating. The underfloor heating is poised to experience exponential growth; however, skilled labor is required at all levels of the value chain. The underfloor heating systems require fine tuning and the custom fabrication of parts during installation to work properly to avoid failure. If the installation is not done by a skilled professional, then the end user typically would need to pay more in the long run for repairs or it may not work efficiently. The requirement for skilled labor is expected to incur additional costs to the system. Also, the operating costs of underfloor heating might be lower than other heating systems, but installation costs are typically higher. These are few constraints of underfloor heating systems, which hinder the growth of the underfloor heating market. Danfoss A/S (Denmark) leads the underfloor heating market. The company has adopted acquisition as a key strategy. The strategic acquisitions offer a growth opportunity to the company, especially while foraying new markets and launching products and services. For instance, in September 2014, the company has acquired Vacon, a leading AC driver player, to strengthen its heating and cooling business. This acquisition has enhanced the competitiveness and innovation of the company in the AC drives market and further improved the position of Danfoss in the market. Also, some of the expansions in developing countries provide an opportunity to cater to a large number of customers and to establish in emerging economies such as India and China. *Details on Business Overview, Product Offered, Business Strategy, Recent Developments, and Key Relationship Might Not Be Captured in Case of Unlisted Companies.